After Halloween, instead of eating all of that candy, we decided to learn from it and explore! We have a forty-five minute class, and I tried to squeeze as many experiments as possible! Here is what we did…. 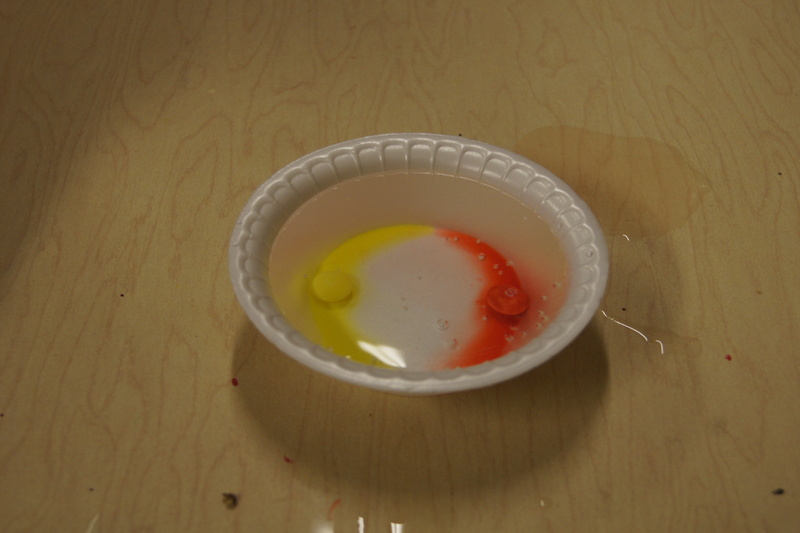 The first experiment was a sink or float experiment. I had a bunch of different candy bars and other candies to try. I also had a perfect container from IKEA to use in our experiment. 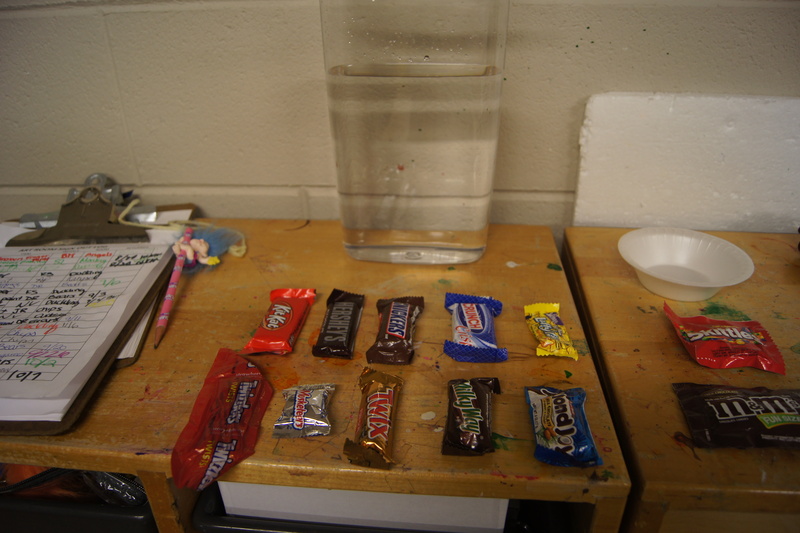 Before placing each candy in the water, the kids made their predictions as to whether it would sink or float. We also talked why we thought they sank or floated and broke them in half to explore the inside to see if that gave us any clues. We explored each candy one at a time, but the kids wanted to try and put them all in the container at the end. They all like the way that it smelled! 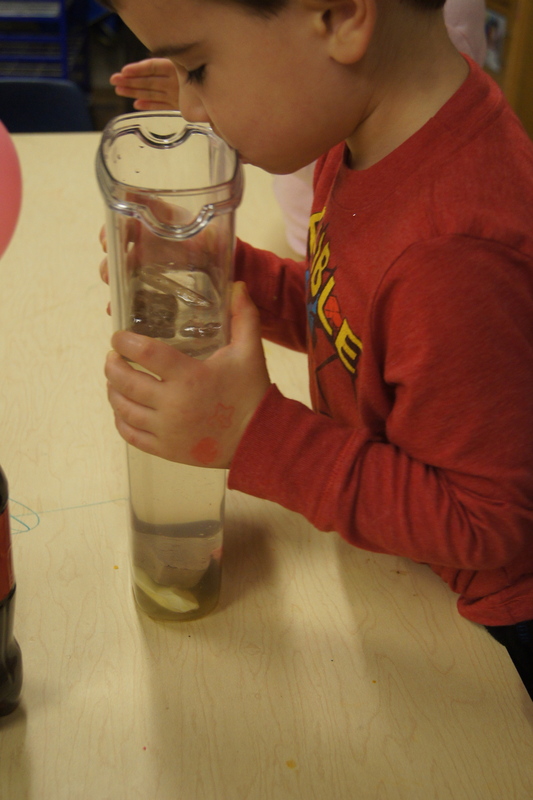 This was a great way to use another one of our senses! 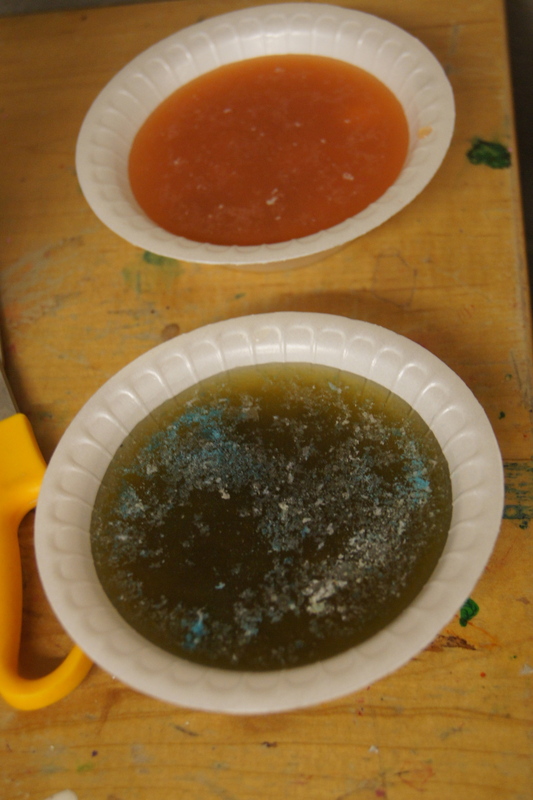 For this experiment, the kids took different Skittles and placed two of them in water. We watched as the color of the water changed. The kids used all different combinations to make different colors. Most of them turned out brown, but the experience was fun. I didn’t get a picture of our Gummy experiment, but we talked about the different characteristics of the bears. 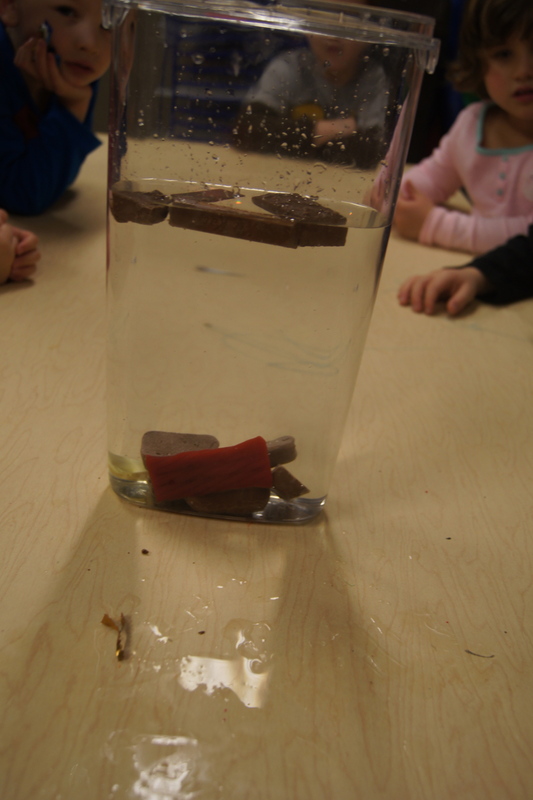 We made predictions about what would happen if we put them in water. I had a couple of bears that I started soaking the night before. We compared them to the bears fresh out of the bag. The soaked bears were larger and really slimy (which the kids loved!). This next experiment did not work out! We put Skittles and M&M’s in water. The “S’s” and the “M’s” were supposed to come off of the candies and float to the top. Not so much, we just ended up with very murky water. However, this could have been due to user error. These bowls were tampered with by little hands. Also, this led to some great exploring after the colors came off of the candies. The Skittles were almost clear and the kids loved feeling them. The M&M’s were fun to play with also. 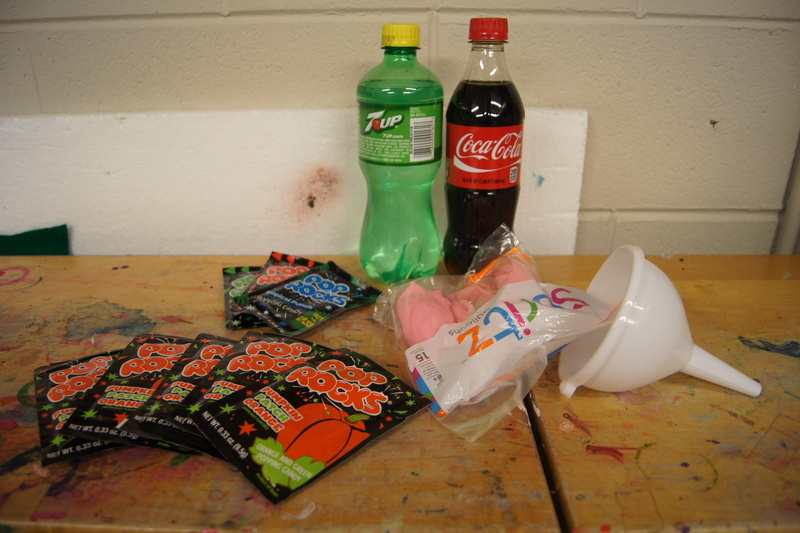 Here are the supplies for our final experiment. We needed pop bottles (we used one dark color and one clear), pop rocks, balloons, and a funnel (our funnel didn’t work that well). 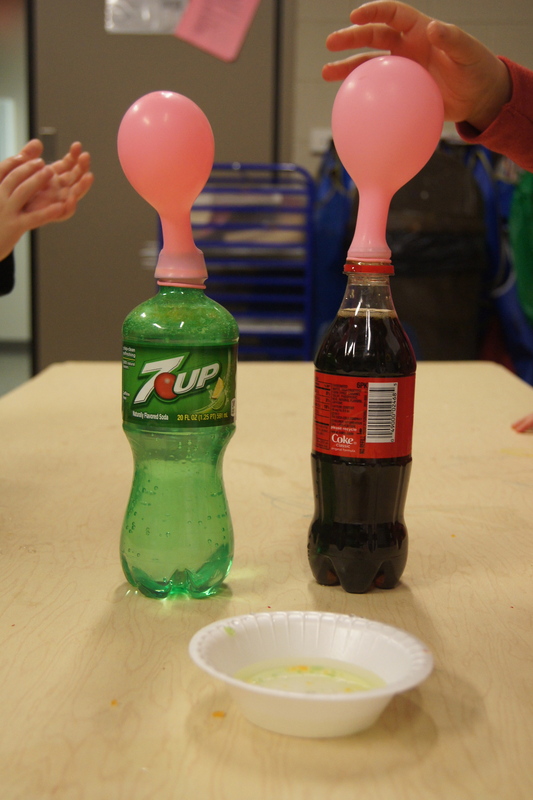 We poured the Pop Rocks into the balloons and then we attached it to the top of the pop bottles. We then poured the Pop Rocks into the pop and watched. Some of the kids hid in the corner of the room for the first one 🙂 After they saw the results, they wanted to do it again and again. The balloons blew up. They gently touched the balloons to feel the air. After this class, we had our best journaling session to date. The kids really reflected on what we learned and saw in our class.